Here is the first edited song from our Live at Ralph's Diner session. Bending Over Backwards. Enjoy! The video for Thank You Note was released a few weeks back and is already creating steam. Not only has it been viewed by thousands of people already, it's receiving some accolades as well. Thank You Note took first place out of 300+ pop music videos submitted to ourstage.com for the month of December 2008. If you haven't seen the video yet, check it out below. This Article was published in The Suffolk Scoop: Written by Rachel Pelkey. The upbeat lyrics describe how the band received family, friends and new people into their Brighton home. Keith McEachern, Brent Battery, Pete McElholm and Ross Lucivero welcomed anyone and everyone into their home to take part in their debut music video. As soon as I walked in the door I was warmly welcomed by McElhom, the band’s lively drummer. Though I only came to cover the shoot, he convinced me to be an extra in the video along with 100 others. It was hard to distinguish a rowdy music video was being filmed inside the unassuming three-story home. Walking down the street in search of the shoot, I expected to immediately identify which house was the site of the shoot, with only the sounds of birds chirping and cars passing filling the air. Once I entered through the door marked “WANDAS Video Shoot,” it was a different scene altogether. In the living room, extras took part by singing-along while listening to the song and reading a copy of the lyrics. With the song on repeat for most of the day, it was certainly hard to forget the catchy lyrics. Family and friends mulled about between the living room and kitchen, all showing their support. Originally from Worcester, McEachern, McElholm and Lucivero had friends and family travel to take part in the band’s big day. While McElholm and Battery organized extras downstairs assigning numbers and handing out lyrics, lead singer McEachern and bassist Lucivero directed the video shoot in a bedroom three flights up a winding staircase. Walkie-talkies in hand, they signaled downstairs when they were ready for a new extra. In the small room, a large professional camera faced a stool in the middle of the room. Bright lights facing the stool were certainly intimidating. I immediately regretted my decision to take part. As I sat in the chair with all eyes, a camera and blinding lights facing me, I waited for Keith’s cue to begin. But once the song played and the camera rolled, I felt right at home. With large cue cards to guide me through the song, Keith danced around the room encouraging me to do the same. In an instant, my nerves disappeared and I became part of the video. With two full days of shooting extras for the video, The Wandas were excited to step in front of the camera to do what they do best. After all the extras had sung-along to the four minute song, the Wandas dressed up and performed as if they were on stage at one of their regular gigs. Thank you to everyone who came out over the course of the weekend to help us with the making of our music video for Thank You Note. Everyone played a crucial role and we appreciate everyone's efforts. We can't wait to finish the video and share it with everyone! Street parking is open to the public, and there is a parking lot across the street that is open to the public, as long as you don't park overnight. For people coming from Rhode Island and Central MA, you can look into the commuter rail at: www.mbta.com. There is a forum setup on our web site for people who want to connect for car pooling. It is located HERE. 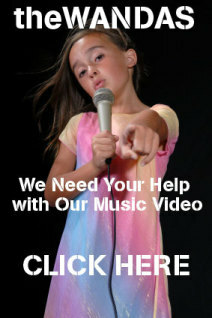 For more info visit the official Music Video Production page. Also. theWANDAS are performing at Great Scott in Allston, March 7th with Krief, (members of The Dears). These guys are awesome. theWANDAS go on at 8:30pm sharp! It's an early one, so please make plans. The Pill dance night follows, which is always fun. Great music, great times. They've also arranged for our fans to only pay one cover for the entire night.